I can’t remember the last time I had something with currants in it. 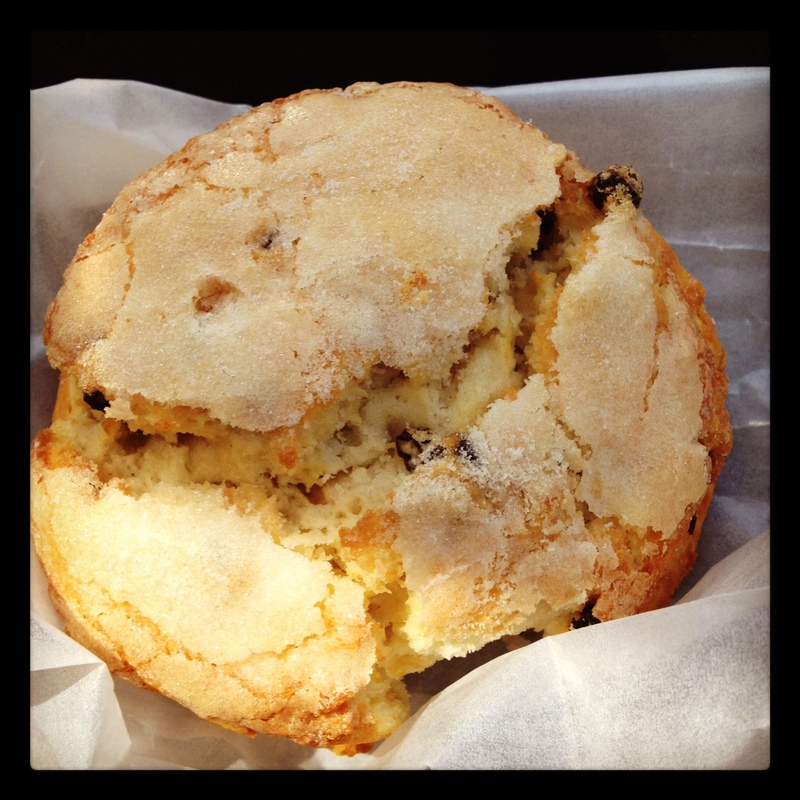 So, naturally when I saw this currant scone on the menu at Rustica I had to get it. If you don’t know, currants are a small berry fruit that is dark purple in color and very tasty. In the strip mall across from the Whole Foods in Uptown, Rustica is not what it looks like from the outside. Honestly, it looks shabby from the outside but once you get inside you are transported to a whole new world of coffee and bread. This bakery and coffee shop looks like it should be housed in an old brick building with ivy growing on the outside and a local bookseller next door who sells leather-bound books. Although, its outside is blah, it is in a great location and is fairly easy to get to if you live in Uptown, Minneapolis. Despite it’s less than glamorous outside, Rustica is always busy because it has fantastic food. I have had several bakery items there and each has been delicious. including this scone. Once you have had one it will be hard to go back to any other scones especially the ones from Caribou. They get baked goods at Rustica. This scone was perfectly cooked with the right amount of browning and had this sugar-coating on the outside which makes a huge difference. The breads are great and most of the time the coffee is exceptionable. This last time I had a very bitter cup, which must have been made incorrectly. But, I could have cared less since I was busy snacking on this scone. The staff always is able to point out their favorite items that have been freshly made. So, take their advice. They know what is good and can point you to items that you might not normally try. It looks like they also make sandwiches there and I am looking forward to having a day off where I can sit in Rustica and drink coffee, eat a sandwich, and write about my adventures in the Minne-apple. because sometimes you need an escape to the old world.